1) You can apply vit. C before applying the A-Ret. First, let the vit. C penetrate into the skin and then apply the A-Ret. Or apply vit. C in the morning, let it penetrate and apply the other creams. Start slowly, with just a few stampings and if the skin heals well, increase it. Basically, you will have to improvise a little, trying different approaches because nobody knows yet what is the absolute best dermarolling approach regarding your skin problem, especially due to the unknown origin of the quick deterioration of your skin. Every now and then, give your skin a longer break from dermarolling. The customer who allowed us to post her photos here also allowed me to give you her email addresse, have you received it? 3) You can mix Infadolan with the A-Ret. They both contain vit. A. 4) We will be delighted to post your pictures. Thank you! Kelo-cote is a silicone-based cream used in prevention or improvement of hypertrophic or keloid scars. The mechanism of action is not completely understood. Several studies findings suggest it is not the silicone itself that has an effect but it is the occlusion and hydration that forms under the silicone sheets which is effective in improving hypertrophic and keloid scars. The clinical effect of silicone cream containing 20% of silicone oil was tested on 47 patients with hypertrophic scars and keloids. A silicone cream/occlusive dressing technique, quite similar in manner to silicone gel treatment, resulted in a remarkable improvement of scars and keloids in 9 of 11 cases (82%) whereas the simple application of the cream onto the scars and keloids of 36 cases resulted in only mild improvement in 8 (22%). Using the chi-square test, a statistically significant difference was seen between these two treatments (p < 0.01). From these findings, we suggest that occlusion and hydration are the principal modes of action of the silicone gel sheet method and our silicone cream/occlusive dressing technique. OBJECTIVE. To determine whether silicone is an essential factor in the treatment of hypertrophic scars and investigate the effects of occlusive dressing therapy on the expression of key wound healing mediators. CONCLUSIONS. This study demonstrates that silicone is not a necessary component of occlusive dressings in the treatment of hypertrophic scars. The pathogenesis of hypertrophic scars is further elucidated by demonstrating that there is molecular evidence for extensive connective tissue remodeling occurring during occlusive dressing therapy. Hydration and occlusion treatment for hypertrophic scars and keloids. Department of Plastic and Reconstructive Surgery, Hirosaki University School of Medicine, Japan. In 31 patients with hypertrophic scars or keloids, a side by side test was carried out to check the efficacy of an occlusive dressing technique using cream which did not contain silicone oil, versus a simple application of vaseline, used as a control. In all cases, the cream treated areas of scar and keloid demonstrated a remarkable improvement over that of the vaseline treated area. These findings strongly suggest that the mechanisms of hydration and occlusion are the main basis of the therapeutic action of this method in treating hypertrophic scars and keloids. BTW, Infadolan ointment that we sell for dermarolling aftercare is a semi-occlusive ointment that prevents water evaporation from the skin and thus keeps it extra moisturized (just like silicone). Adding "water creams" or glycerin to the skin does not moisturize it for more than several minutes. Topically added water actually increases the evaporation of water from the skin. The skin contains enough water. The top layer of the skin works as a barrier that prevents evaporation from the skin. If this barrier doesn't work properly or is temporarily compromised, the skin becomes dry. Adding water does not solve it. Establishing a barrier that prevents water evaporation solves it. That is why oils are much better moisturizers than any light moisturizing cream because oils form a film on the skin that prevents the evaporation of water. The film however can be a problem with acne prone skin. You can wrap your scar into food wrap to enhance the occlusive effects of Infadolan or other products. Dermarolling / Microneedling / lines around the eyes and mouth? You look much younger than you are. 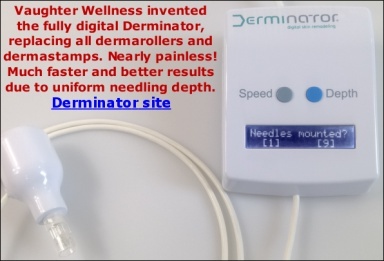 The best approach in your case is a 0.5 mm dermaroller (used twice a week on your entire face) and a 1.5 mm dermastamp (used once every three weeks on your scars and indentations). Dermastamping is more laborious but you do not have to do both cheeks in one go. It is better to stamp one cheek thoroughly and the next day or any time later the other cheek. Yes you can do that, but you should not reuse the solution, so you can't soak the rollers directly in the litre of solution but have to poor it first into a glass for example. How much Chloramine you need depends on the volume of the container you use to put the roller in. If you use a longdrink glass, you'll need very little. Is your skin texture a result of acne or was acne not an issue? How long the redness lasts is individual but on average, the initial redness that looks like a sunburn is gone within a few hours. There can be some residual redness, lasting for a day or two but this is not very noticeable. Some of our customers with sensitive skin are still quite red a day after dermarolling with long needles. That is why it is better to do the first roll without planning an important social event the day after - or do just a small test patch first. It also depends on what kind of product you apply afterwards. If you apply a cream that contains an acid (glycolic acid, lactic acid, retinoic acid, salicylic acid etc), it will make the skin redder. Single needling redness lasts longer and aggressively and deeply needled stretch marks or scars can stay red for a week or longer. How is your redness today? The customer who has been dealing with a similar problem as Cheeky allowed us to post her emails and photos. Email and a photo of the right cheek from Sep. 12, 2011.
became increasingly worse:( not very smart. Yes, my skin has improved some and I am hopeful for even more success. I rolled with the 1.5 3x 4 weeks apart and then rolled w a .5 weekly 3x. de-stress a bit. I am pretty sure stress caused major problems for my skin. with her skin is probably adding to the problem. I believe that derma rolling has been helpful for sure. a combination of things as well. No, dermarolling will not help with these lines, because they are not wrinkles. You have a wrinkle-free face. In the future, you will likely develop crow's feet but you do not have them yet. The line at the outer edge of your lips is a skin fold. I know I may sound annoying but the baby from the link above also has the same fold. We are born with skin folds. As we age, the folds deepen due to the drop down of the skin and the underlying skin structures. A mild skin laxity can be improved by dermarolling and tightening the skin by dermarolling can slightly improve the depths of skin folds deepened by aging. Your skin however doesn’t have any laxity and other signs of aging. There is nothing dropping and in my opinion, nothing to improve. Dermarolling / Microneedling / Is this normal ? No that is not normal and I am sorry about this! The skin on the arms is thinner that the skin where the stretch marks routinely are - the hips, buttocks, thighs etc. Single needling thin skin deeply can unfortunately cause bruising. If you send me an email with your address, I will instruct our dispatch center to send you shorter needles for free. We have some in stock. It could also be that you received some that were a little too long. We have ordered a new batch of single needles that are shorter. Unfortunately I have to disappoint you. Dermarolling or needling cannot be performed on the eyelids due to the risk of eyeball injury. I advise consulting a dermatologist or perhaps a plastic surgeon.